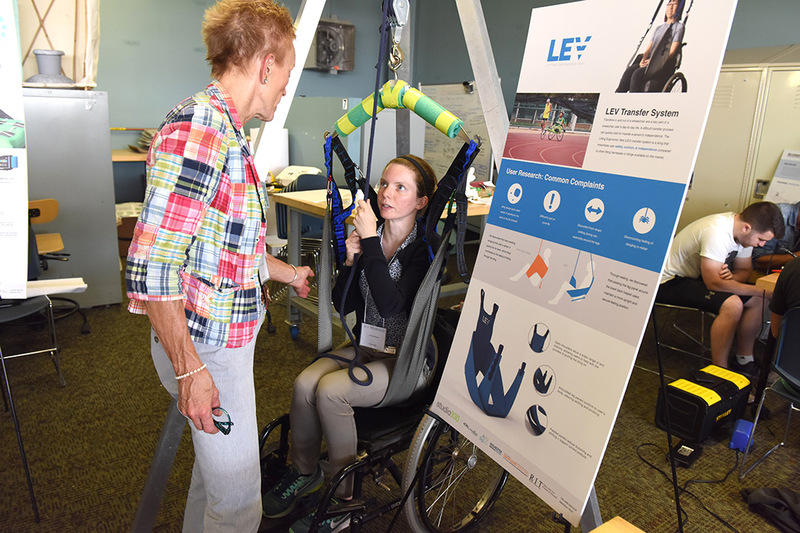 Ana Sorensen, right, a fourth-year industrial design student from Davis, Calif., demonstrates LEV, an assistive lift, for Mary Dombovy, vice president of neurology and rehab medicine at Rochester Regional Health. Rochester Institute of Technology student Kevin Farnand has been part of the Studio 930 Design Consultancy since its inception three years ago. But this summer is particularly special for Farnand, who proudly announced that a product he has been developing will soon be used by children with attention disorders at CP Rochester, a local organization serving individuals with and without disabilities. 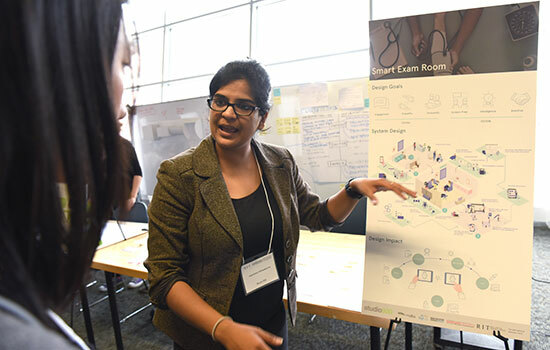 On Aug. 7, Farnand joined 29 other students at the exhibition of the summer consultancy, a 10-week long multidisciplinary studio experience focused on the design and production of access and health technologies products. 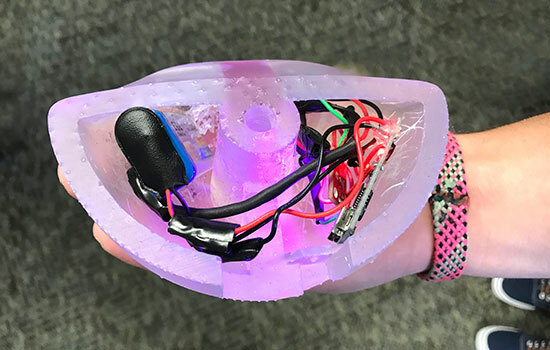 The program was created by Stan Rickel, associate professor of design at RIT and director of the industrial design graduate program. This summer’s products included an automated toilet paper dispenser, a hospital bedside table for optimal use by patients, and a secure and ergonomic sling for lifting individuals, to name a few. 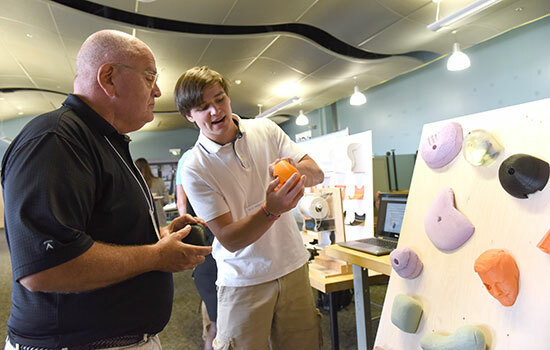 The program is supported by RIT’s Simone Center for Innovation and Entrepreneurship, industrial design Master of Fine Arts program, College of Art and Design, Kate Gleason College of Engineering, College of Engineering Technology, Saunders College of Business, and the Waldron Rise Foundation. Community agencies included in the project research were Al Sigl Community of Agencies, Rochester Regional Health and CP Rochester. Michael Cocquyt is the supervisor of the SportsNet program, a collaboration of Al Sigl Community of Agencies, CP Rochester and Rochester Rehabilitation, which provides adults and children with disabilities the opportunity to explore adaptive sports and inclusive recreation. Cocquyt worked closely with several RIT student teams, including the developers of an assistive ski lift, which will be used this winter at Swain Resort. Cocquyt said that RIT breaks down that barrier. Siqi Xu, an industrial design graduate student from China, worked closely with the Al Sigl Community of Agencies to develop an automatic toilet paper dispenser. The project was first introduced in 2015, and now, Xu is able to explain how the product will cut, dispense and fold toilet paper without it even being touched by the user. She’s hoping to see her product used in health centers and one day in private homes.